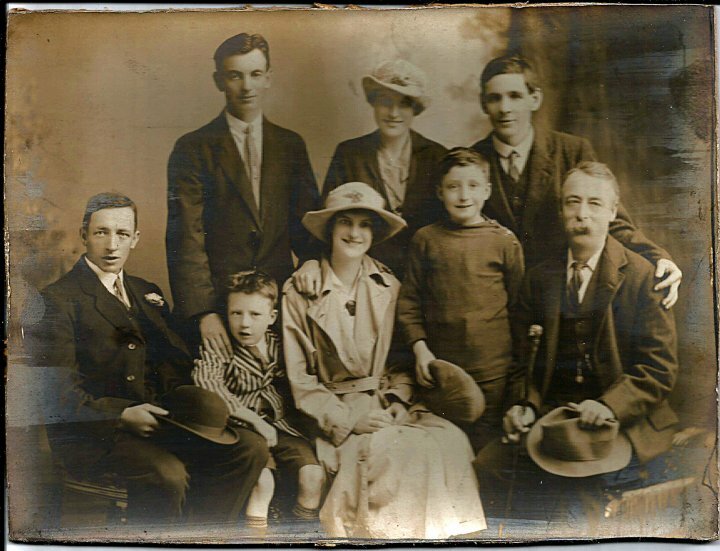 This is a family group of the Bartlett Family of Pilton together with Edward and Jane Hobbs and is thought to date from the 1920s. We have identified them in relation to Jane Hobbs (née Bartlett in the centre back). We are pleased to have been given this photograph after the death of Jane ‘Jennie’ Hobbs, the daughter of Edward and Jane, in January 2018. It was found among her papers with a number of other interesting documents. The picture does not include the siblings’ mother, Jane Bartlett, who was married to William Bartlett and was the grandmother of both Mary Passmore and Jennie Hobbs. Jane and William lived in Warwick Terrace, Yeo Vale, and at No 8 Pilton Quay, a cottage which was demolished in the 1960s for road improvements at Pilton Bridge.